Fully loaded with all cargo, including water, this trike comes in at about 75 pounds. This page will be devoted to what to pack for fast and light overland triking journeys. The page will grow over time, primarily with photographs, which they say are each worth one thousand words. For example, I could describe what I now carry in my bathroom bag, even providing the size of the containers verbally in text, but hey, tossing in a photo such as what follows below gets the point across faster, and sticks in your mind better! You can see simply by looking that the size of the shampoo container is not much larger than a standard container of dental floss. With the toothbrush as a size referencing object, it is also easy to determine that the other items are quite tiny compared to normal ideas of what is needed in a bathroom bag. Experience on the road teaches many things! Here is what I have learned is necessary for the trips, all downsized considerably over what I used to bring, and all other unnecessary items removed and left at home. Subsequent to this photo image, the conditioner and shampoo have been eliminated (suggested by an astute TA reader), and the special health-oriented soap will be used instead for the hair. See farther down this page for the new toiletry contents, and a link to the body wash.
On my first five years of overland trike journeys, my bathroom bag was quite heavy, and took up a fair amount of pannier space. Its weight was such that I always packed it low in my side panniers to keep the trike’s center of gravity as low as possible. This new paradigm of Fast ‘n Light is less than half the weight of those “old” days where I lugged tons of junk up every mountain pass and hill, regretting all that I had brought along in the miscalculated idea that I would need every conceivable item. That was my former “better bring it along just in case” mindset, where I attempted to be ready for all possible eventualities, regardless of how unlikely they might be. The old Boy Scout motto of “Be prepared!” was making my trike treks ordeals of torture! Enough of that! Overland trike journeys should be experiences of elated joy as the triker sees the world in ways never known by the habituated masses propelled by automobiles. 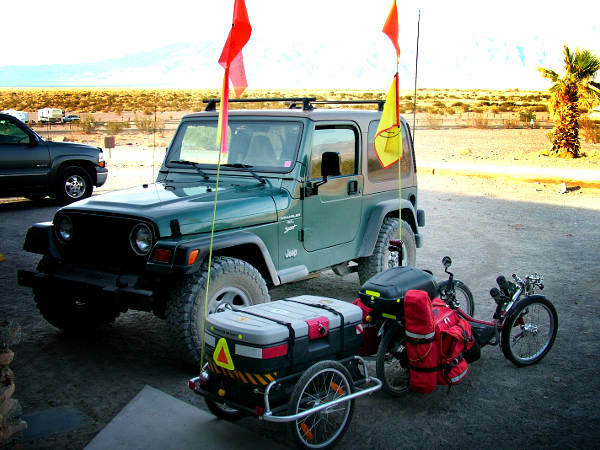 In order to have the most fun on a trike tour, the triker’s trike and cargo should be as lightweight as possible, something that most all overland trikers eventually learn, usually the hard way. I learned the hard way, despite excellent advice from those who knew better. Back in 2009, I pulled a trailer, and had a rolling weight (everything, including me, the trike, and all my cargo) of 375 pounds. Over five years later, my rolling weight is about 250 pounds. Losing those 125 pounds was the best decision I ever made! (NOTE: These numbers have decreased yet again – read farther along to learn more. This is an ongoing evolutionary process.). Of course, as part of my newly adopted, and passionately followed, Fast ‘n Light model of trike touring, I also acquired a fast and light trike to make things even better. In early 2014, I replaced my old trike with a high performance speed trike, and have not regretted the decision at all. The good news gets even way better because without all those endless and overloaded miles laboring up steep mountains that I used to do on my trips, I would not have fully enjoyed the way things are now! The comparison keeps a smile on my face, and since it has been so utterly wonderful, I felt compelled to share all this elation with you right now on this page. It’s your lucky day! Look at that trailer I used to pull! I’m glad to be rid of all the unnecessary weight! Here is my current (2014) mode of travel: 235 pounds rolling weight (includes me). 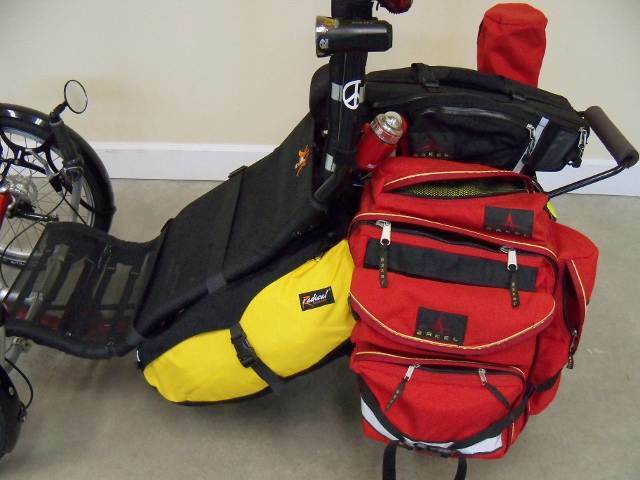 One great way to begin your Fast ‘n Light transition is to replace those large and heavy panniers currently on your trike with small and lightweight panniers. By downsizing the cargo containers on your trike, you will be forced to concoct a new packing model, simply because all the unnecessary junk you were taking along won’t fit anymore. This method of change necessitates that you rethink your ideas of what you absolutely “must” have with you. This idea has worked very well for me! I get the smaller and lighter bags, and sure enough, I figure out a way to make the best use of the space. Human nature is such that if the space is available, we will fill it. I’ve heard riders say that they just won’t fill the bags as full, but have found this logic to be faulty, as they usually do just go ahead and load them up anyway – fear tempts us to bring more. So, we have to force ourselves to downsize by getting rid of the big bags and getting small bags! Oh, and if you have a trailer, that, of course, must be the first thing to go. For those of you who may be poo-pooing all this banter here, keep an eye on your knees over time, and see if they agree with the “more is better” mindset. Enjoy the ride – stay light and travel easy! Here are my former side rack bags (red ones), at 54 liters total volume. They held everything! Believe it or not, soon after I disposed of my trailer (after my 2009 Death Valley trip), I actually seriously contemplated the acquisition of 84 liter bags to replace these red bags! At the time, I simply could not see how I could take overland journeys without the trailer, or really large cargo bags. My mind was not ready to redirect itself. Here are the replacement bags, at 28 total liters. They hold the essentials! Another place where you can lose a few precious pounds is in your tent. 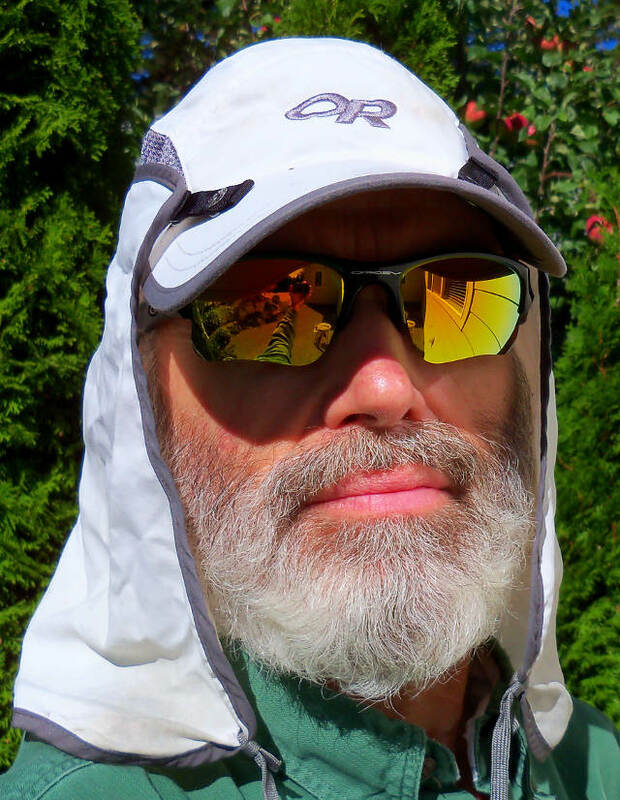 For the first years, I used an REI Arete’ tent, which weighed in at just over 6 pounds (including the fly, footprint, stakes, and carrying bag). When the zipper finally failed after nearly 60 overnights in it, I replaced it with a NEMO Obi one person tent, at less than half the weight (fantastic tent, by the way – highly recommended for minimalists). 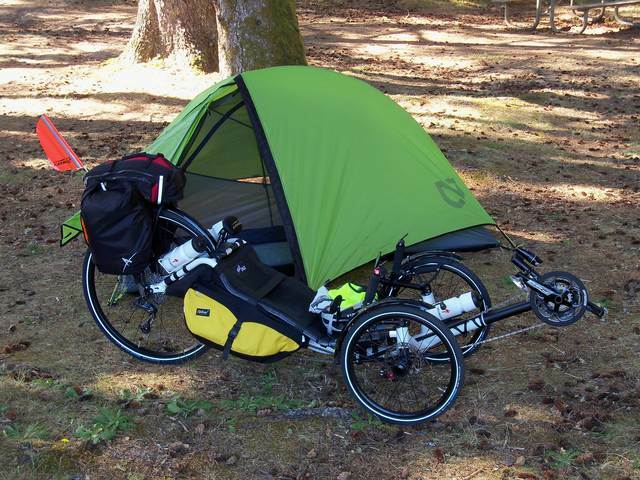 This was an outstanding decision, as not only is the tent significantly lighter weight, but it sets up in half the time and takes up far less room in my panniers. I used to think that saving 3 pounds on the tent was no big deal. Sure, you could say that saving a pound here and a pound there is so minimal that it doesn’t matter. Yet, I have learned (the hard way) that all those little stray pounds add up very quickly, as you can see by how I downsized even my bathroom bag at the start of this page (after that photo was taken, I have reduced the contents further, and will comment later). By continuing to do this downsizing, I have been successful over the years in making my pedaling very easy compared to what it used to be. I want to enjoy my ride, and so do you! NOTE: A quick word about the Fast ‘n Light terminology, and what it refers to, might be in order here to alleviate any confusion. A few folks have the idea when I talk about fast and light travel that I am advocating speeding through one’s overland journey as fast as possible, with the core focus on speed. This is definitely NOT the case! First of all, trikes are slow compared to conventional human vehicular travel, regardless of how much or how little the trike nomad has in the cargo bays. My emphasis on this page is to make our overland treks as ENJOYABLE as possible, in a way that does not damage the body’s connective tissue, and does not cause one to regret the trip due to the cumbersome load and extreme physical exertion necessary to get up all the hills and mountains. Overland triking is a challenge! By significantly lightening our cargo loads, the journey immediately becomes easier, more enjoyable, and one that invites us to return to the open road again in the future. Overloaded trikers are slow, damage connective tissues such as in the knees, and eventually begin to think they are in some kind of a torture gauntlet, regretting the decision to begin the trip in the first place. If we have fun doing something, we’ll likely be doing it again. If we are injured doing something, or existing in an unpleasant state, once will be enough. Even if the body holds up under an overloaded condition, the mind may not fare so well, convincing us to abandon trike trekking. Why return to an activity that brings us misery? My own transition to a lighter traveling model occurred over a five year period, and with each new trip at a lighter rolling weight, I was even further motivated to lighten my load even more to make my trip easier, and thus more enjoyable. I compared what it was like pedaling around town and on long day rides to what it was like pedaling overland long distances with a bunch of heavy cargo loaded onto my trike. The difference was astounding, and quite dramatically revealed to me the folly of carrying anything with me on trips that I did not absolutely need to have in my possession. 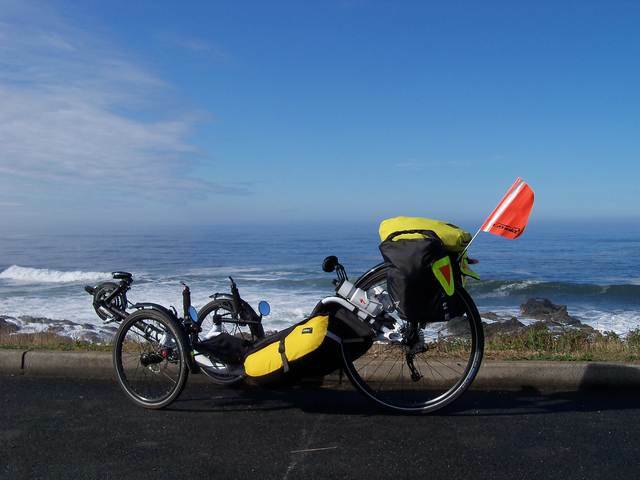 My goal was to trike tour with the same freedom and ease as I have on day rides, and while that is never fully possible, closing the gap became my goal. When a triker travels lighter, (s)he also unconsciously travels faster. It’s not that the triker has a goal of traveling faster, but since it is easier to maintain a higher speed with less weight, it just happens naturally. Additional speed is a natural result of reduced cargo load – it’s that simple. I don’t ever try to race through my overland rides, but my speeds are up from what they were five years ago simply due to my lighter load practices. My body has thanked me in many ways, most notably being in the complete cessation of hot spots in my feet (this was also helped along by my shoe/pedal/pedaling paradigm). On my first overland journey in 2009, I seriously wondered if I could do it again because of my severely aching feet (Nerve Compression Syndrome), which resulted from my rolling weight load of 375 pounds (included a large trailer) and my ignorance on how to pedal and what shoes to wear. 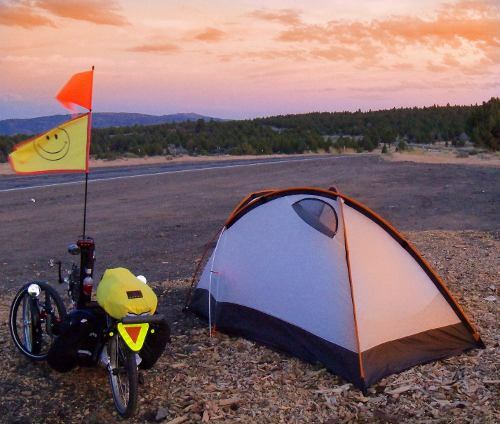 I want you to have fun when you take an overland journey on your tricycle. This is best accomplished when you have a lightweight cargo setup. You still enjoy all the scenery the ways only a triker can, and you still have to put out plenty of physical exertion, but the chances of hurting your body are greatly minimized! Once place where I saved notable weight, while reducing the amount of cargo space necessary on my trike, is through the sleeping mattress I use. When I first began this long haul pedaling, I brought along a large inflatable air mattress, the type folks often use while car camping. It was very comfortable of course, but it was also quite heavy and required a large amount of storage volume. Since I had a trike trailer then, cargo area was not a concern, so I just threw it in the trailer, but once I realized the folly of my overpacking, it became apparent that this mattress had to go. 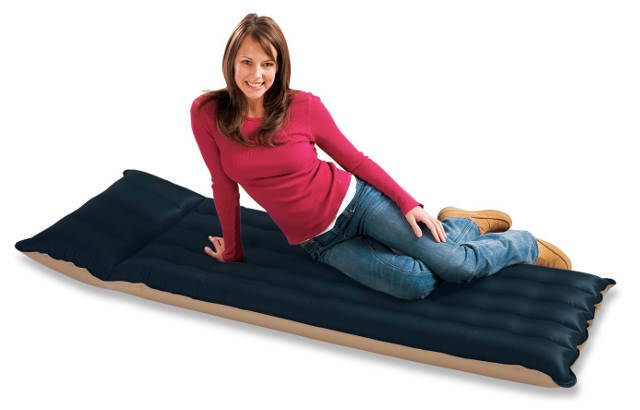 This is the old type of air mattress I used in 2009, comfy, but HEAVY! 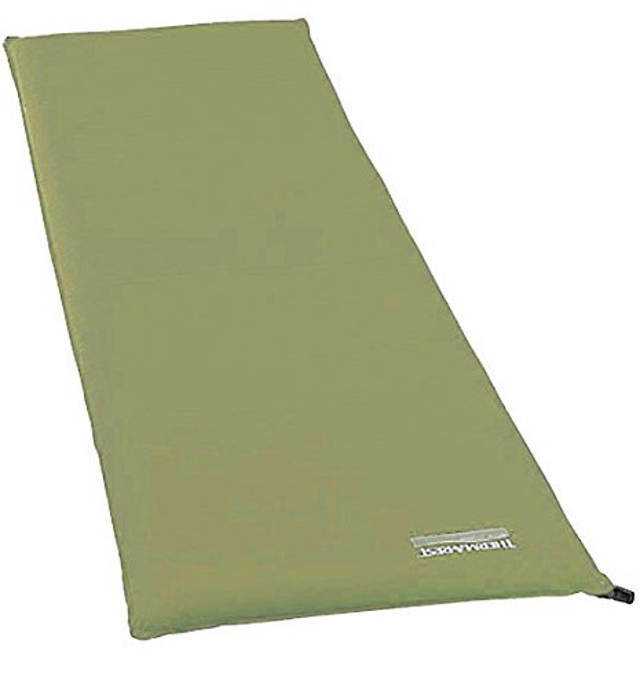 Thus, I began a search that next year for the lightest and most compact sleeping pad I could find. 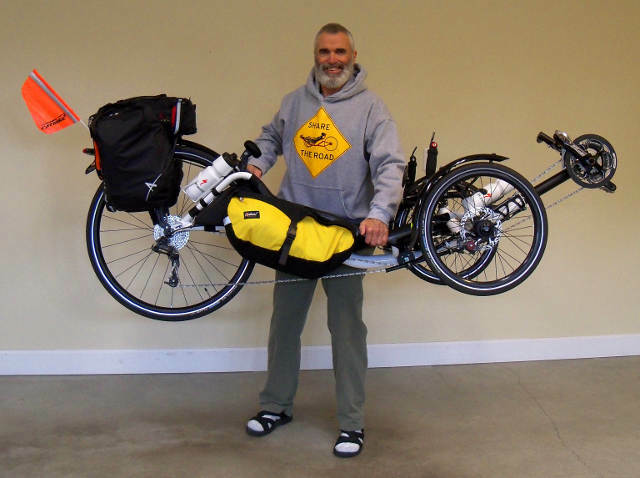 I noticed that most touring bicyclists were using the old style ThermaRest roll-up mattresses, and usually had to bungee strap them atop their panniers somehow. That old style was not very comfortable, nor was it space effective, being a very large and awkward piece of cargo to have to stash on the rack somewhere. You still see, even today, most cyclists pedaling along with these large things hanging on wherever they can fit them. This was NOT an acceptable solution for fast and light trike travel! Money was not going to be an object for me in this decision, so I set out to acquire the absolute lightest weight sleeping mattress I could find, and one that also was compressible into the absolute smallest space possible. 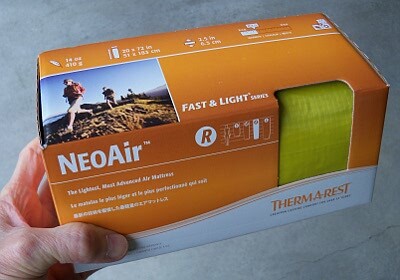 I ended up getting the ThermaRest NeoAir Fast & Light mattress, which was very lightweight, and could be rolled up to a size only seven inches wide by four inches diameter! This pad has proven its worth to me for several years now, and despite its somewhat fragile appearance, has never leaked air or ripped. I only weigh 160 pounds, and am very gentle with my equipment, so I cannot speak for someone who outweighs me by a wide margin, but I suspect this mattress will do the job even then. 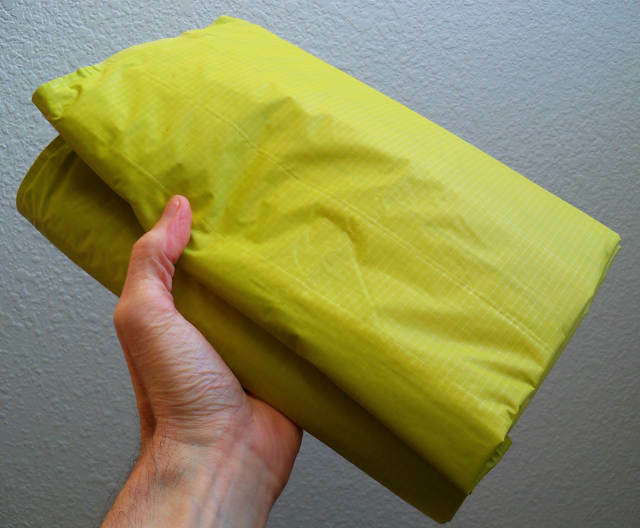 Lightly folded, the NeoAir is small. It folds or rolls much smaller than this if desired. This is how it comes packaged in the box, and it can easily be reshaped to this size later. One very obvious, but usually overlooked, way to travel with less stress on the body’s joints and connective tissues is by utilizing an efficient organic engine. Fast ‘n Light travel is a moot point if the engine is made of cast iron instead of aluminum. A trike’s engine is the pilot – the person who is pedaling it. I have witnessed many trikers who are carrying a significant amount of unhealthy bodyfat on them, and of all things we can discuss for this model of enjoyable overland triking, the engine is the major factor. Excess bodyfat weighs a triker down while pedaling, and places much more stress upon the bodily systems than a triker who is physically fit. Connective tissue does not grow larger and stronger in proportion to the addition of 50-100 pounds of bodyfat a triker may accumulate on the body, thus injury potential is greatly magnified. It does little good to save two pounds on a sleeping pad if the engine of the trike is 74 pounds overweight. This page is not about weight management or attainment of maximum health and fitness (click HERE to see that article), but here is one product I use as part of my healthy model of maximum functional longevity. It is made by Garden of Life, and is called Raw Meal, a total nutritional feast in powder form, which can be added to any manner of food or drinks, or used as a meal replacement once a day if you are looking to drop excess weight and live a longer life. I just use it as added food insurance to supplement my normal eating (normal for me, but probably bizarre for most). Click HERE to see a short video about this product. Raw Meal seems pricey, but if you consider what you get, that is only an illusion. It is available at Amazon for a lower price than in standard health food stores. For example, I paid $55.00 for one of these 2.7 pound containers at Fred Meyer, but you can get it at Amazon for only $36.33, which makes it very affordable. Into six stuff sacks went these primary items that will fill the Arkel Dry-Lites panniers. In the right side pannier, I will have the pants & shirts, socks, under wear, and sleep wear. In the left side pannier, I will have the rain gear, cold weather jacket (stuffable Mountain Hardwear quilted), and any other such items as necessary. Using these small stuff sacks works well for this type of pannier that does not have separate compartments for items. My former Arkel GT-54 panniers had many sections to stuff all kinds of things, but with these new ultra lightweight panniers, the only way to organize my gear is to segregate the items according to a logical and easy to find model. So, these little stuff sacks go into the single-room bags, and when I want to sleep, I simply pull out the sleep stuff sack, and nothing else falls into disorganization when the bag is removed. 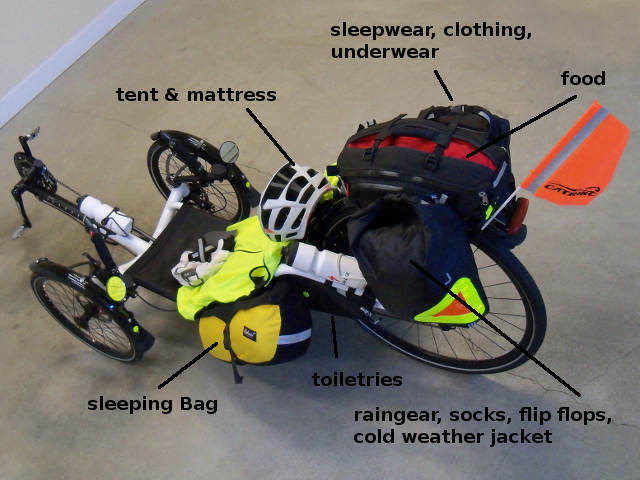 If I simply placed all these items in the panniers loose, by the end of the first day and night, all my gear would be a jumble of stuff inside, requiring sifting through to find what I want. My bathroom supplies, shown earlier at the top of this page, are now reduced by eliminating the shampoo and conditioner, and my Seventh Generation Nourishing Body Wash will stand in for my hair as necessary. Of course, it will be in that little bottle I labeled “liquid soap” in the first photograph, not the large container you see on their website if you click that link. Ready for the open road of adventure! This is Fast ‘n Light before your very eyes! With my former ICE Qnt fully loaded (with significantly more gear, mind you), I could not lift it up from the ground. With this Catrike 700 (packed with the Fast ‘n Light ideologies), I am able to EASILY lift it, hold it comfortably, move it around, or place it in the bed of a truck for transport. What a HUGE difference this packing paradigm has made, and of course, what a pleasant difference it will make while touring, going up mountains, and smokin’ down the road over long flat stretches of ground! I LOVE it! 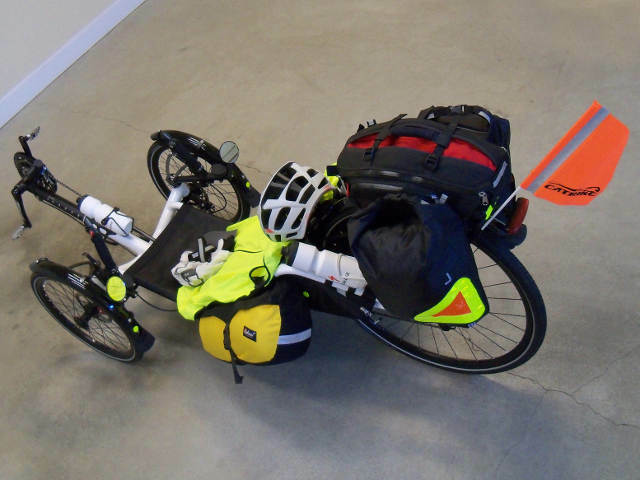 In 2009, my rolling weight was 375 pounds (including a trailer), but now with this revised setup, my rolling weight comes in at 235 pounds, 140 pounds less weight my legs and lungs have to pedal up every mountain and hill between me and the destination. 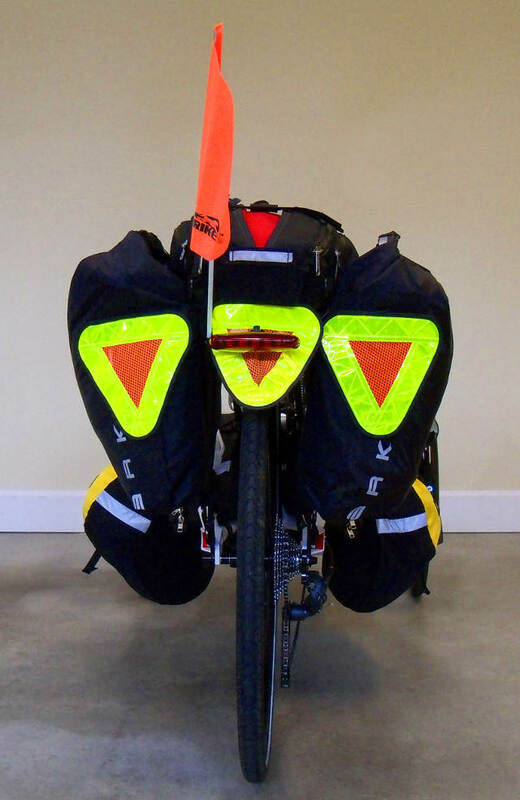 Since the Arkel Dry-Lites waterproof panniers do not show up at all in traffic situations because of their black color, I have enhanced the motorists’ viewing pleasure by adding these Aardvark Safety Triangles from Hostel Shoppe. Now, they all see me (if they can catch me). 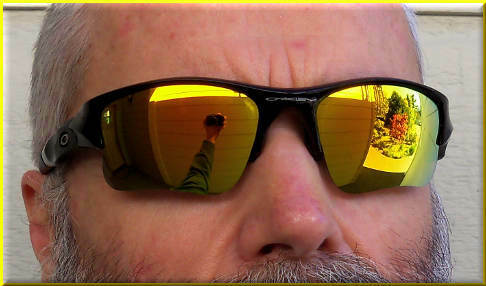 WICKED FAST GLASSES FOR A WICKED FAST TRIKE! Yep, ya’ need some of these beauties if you’re ridin’ a Catrike 700. Click image, or HERE, to visit the Oakley site and get a pair for your head. This is the Oakley Flak Jacket XLJ model, with polished black frame and fire iridium lens for the hot look that is guaranteed to get you noticed on your trike. Cool man – can’t wait to ride! BACK ROW: toothbrush and holder, liquid soap (Seventh Generation Nourishing Body Wash), skin lotion, beard comb. 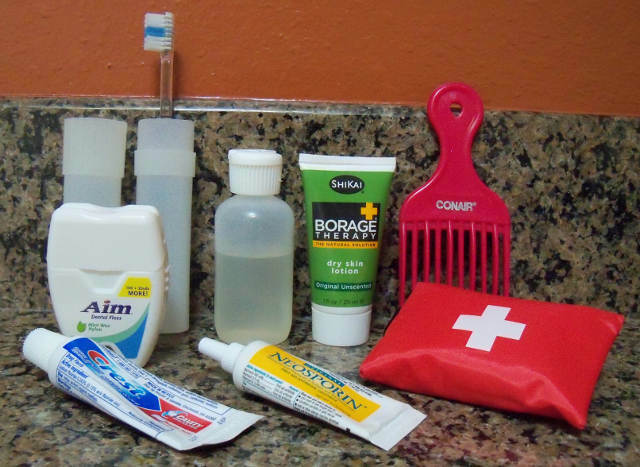 MIDDLE ROW: dental floss, first aid kit. FRONT ROW: toothpaste, antibiotic ointment. 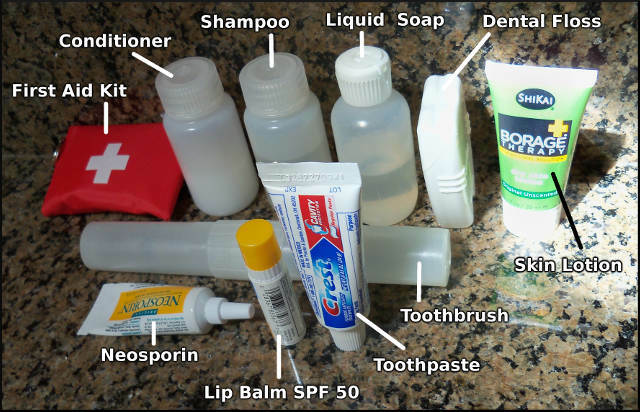 This toiletry kit, which I actually used on my 2014 trike ride of the northern Oregon coast, is noticeably lighter weight than the one pictured near the top of this page, due primarily to the loss of shampoo and conditioner (both heavy liquids). This product is what I now use for all-over body cleansing, including my hair. It saves me the weight of shampoo and conditioner, and does a fine job as a healthy replacement. This is the Seventh Generation Nourishing Body Wash. I recommend it (of course, you must put some into a small bottle – do NOT use this large bottle on an overland journey). 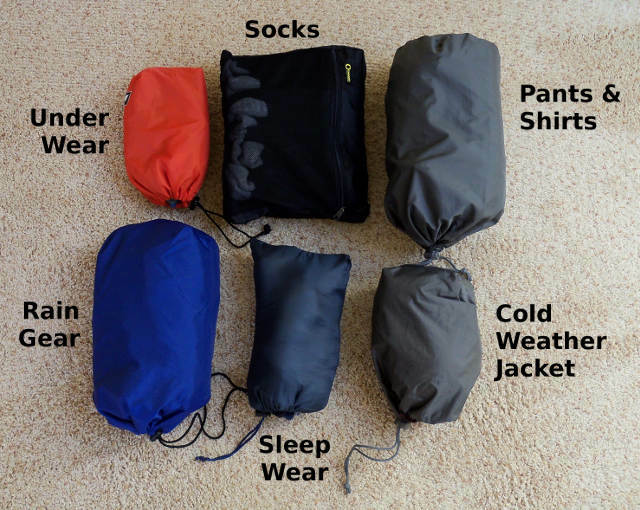 On my 2014 trip along the coast, this was my packing system. 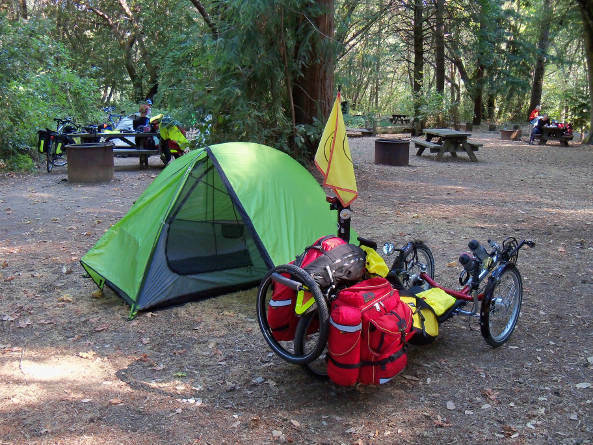 Since I now leave my bags on the trike at night (one person tent too small to take inside), my food is contained in the OPSAK odor-proof bag system (see TA article). 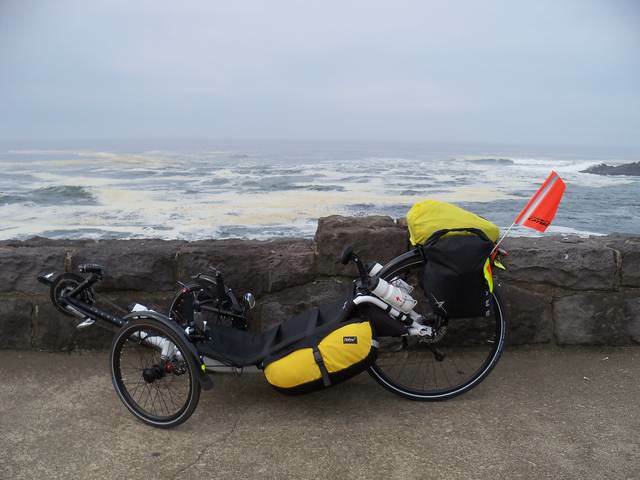 In September of 2014, I pedaled the northern Oregon Coast, a five day trip from the Columbia River to Florence, Oregon. I used for the first time the Arkel Dry-Lites panniers, a total volume of 28 liters (1708 cubic inches). Arkel formerly advertised these bags as 32 liters (1952 cubic inches), but recently modified their claim to more accurately represent the bags’ true volume. I have not filled the bags with water to verify the actual capacity (easy to do), but I believe the updated 28 liters is accurate based on what I see on the trike (32 liters just seemed too large for the actual space available when loading for a trip). I suspect a rider must have taken Arkel to task, thus showing the larger sizing to be false. Unrolled, they may hold the 32 liters, but once rolled down to close the top, much volume is lost. These bags are super ultra lightweight (14 ounces)! They are black, and do not show up well out on the road. For my purposes, I was impressed with the Dry-Lites. At first, having never used a roll-down closure bag before, I was cautious regarding how well I would like these bags. I was used to the more traditional zippered bags. However, with this short trip behind me now, I can say that I was duly impressed with the ease and simplicity of these bags. I really liked how they load from the top, rather than from the sides as found in many bags. Simply by unrolling the top of these waterproof bags, I had all my contents at my disposal. I kept my items in small stuff sacks for organization (see above), because these Dry-Lites have only one compartment, with no dividing walls. For a 700c drive wheel, you don’t want larger bags – too much weight up high causes the rear end of the trike to sway laterally with each pedal stroke – not as stable as a traditional 20 inch rear wheel. Keep your rear rack weight VERY light if you ride a 700c! These bags are small, probably too small for most trikers on overland journeys, but they are perfect for my new Fast ‘n Light packing strategies, forcing me to rethink my cargo needs more realistically, forcing me to think more like a backpacker than a touring motorcyclist. On my former trike with a 20 inch rear wheel, the side zippered bags necessitated me bending way over, or even kneeling on the ground, to access my cargo, but with my new trike and its 700c rear wheel and these top-loading Dry-Lites, I can stand erect and easily get to anything I may need (particularly helpful if weather is inclement). The Arkel Dry-Lites are perfect for Fast ‘n Light travel on a trike. I really like these Dry-Lites waterproof panniers having used them on the road. They are indeed totally waterproof – it did rain on one day, and my contents remained fully dry inside. They weigh practically nothing (less than one pound, believe it or not), and attach to the rear rack simply by the use of Velcro. The attachment system is kind of weird, and it does not play totally well with the Arkel TailRider top trunk, but it works well enough to be an excellent choice. The TailRider attachment straps must be fed through the Dry-Lites attachment system (clunky), but since I only do this once at the beginning of a trip, it’s no big deal. I do not remove the bags at night. My bags are quickly observable at night from my NEMO Obi tent. These Dry-Lites are very poor for rearward visibility, as they are totally black, except for some small white reflective material on each bag, which does not show up in daytime hours to motorists coming from behind. Thus, as you can see in the photos on this page, I have added some Aarkvark Safety Triangles from Hostel Shoppe, and now I show up very well to drivers of automobiles. Several riders on this trip commented to me how visible I was, even back quite a ways. If you use these bags, please add these safety triangles (using silicone sealant/glue to hold in place). 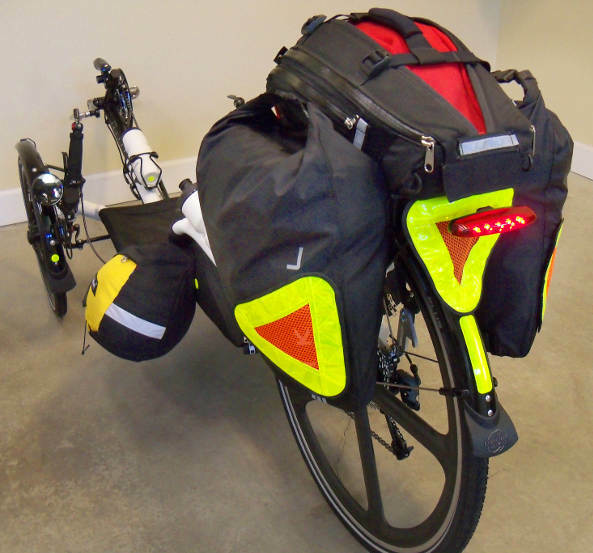 This hokey aftermarket fix would not be necessary if Arkel would produce the Dry-Lites in a high visibility yellow material instead of black (hopefully, they will read this evaluation and offer a future bag that is safe for the road). The Dry-Lites must be augmented with some sort of safety solution for motorists, otherwise you will just disappear into the shadows on the road! This is my countermeasure. So, for those of you who are ready to travel fast and light instead of slow and heavy, these bags are a natural contender. Yes, they are indeed small, but for the Fast ‘n Light paradigm of triangular journeys, that is precisely what you want! 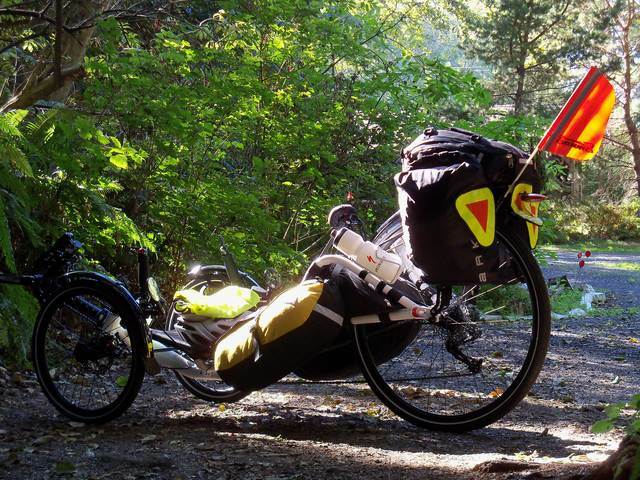 Once you learn to bring less cargo, you will appreciate the ease of travel compared to before, and will realize that super ultra light bags like the Arkel Dry-Lites waterproof panniers are just the ticket! 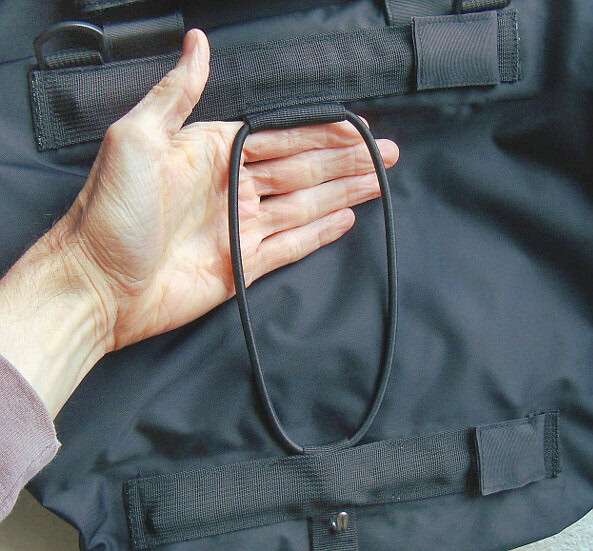 The attachment mechanism for the bottom of the rack is pretty standard, with a bungee cord that hooks onto the rack’s lower attachment point. 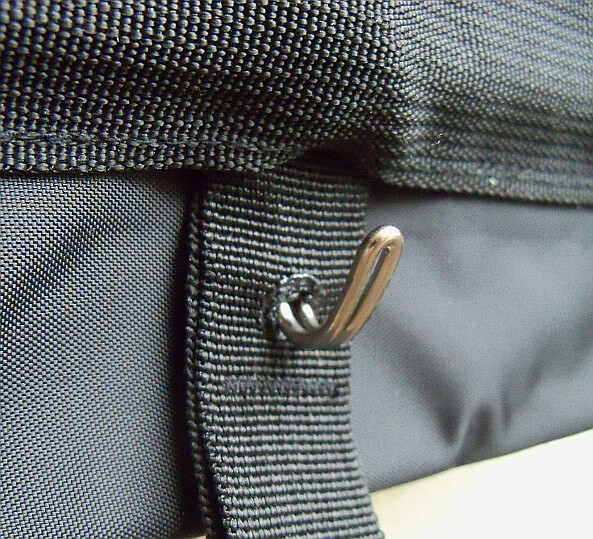 The metal hook is very robust, and holds these bags securely on the rack. These Dry-Lites are very durable, and I suspect they will last a long time. Of course, as the tops must be folded over and rolled down to close the bag, and keep the rain out, I wonder how the material will endure with the repeated foldings over the years. Well, I guess I’ll have an answer for you sometime in the future – hopefully the distant future! Arkel TailRider top trunk video. Although not shown in this video, the TailRider expands laterally to hold much more cargo than depicted here. There is an expansion bellow on the top, so you can put quite a bit in here (I keep my food in this trunk). It expands to 11 liters.